PARTNER NEWS: Two thousand HID Trusted Tags have been installed in “one of Manhattan’s most iconic skyscrapers” to improve the security and management of the building’s fire and safety sprinkler system. The tamper-evident NFC tags incorporate cryptographic authentication and a QR code and have been placed on every component of the building’s sprinkler system, enabling technicians to tap each tag with their mobile device to authenticate that they have completed each element of an inspection or repair. 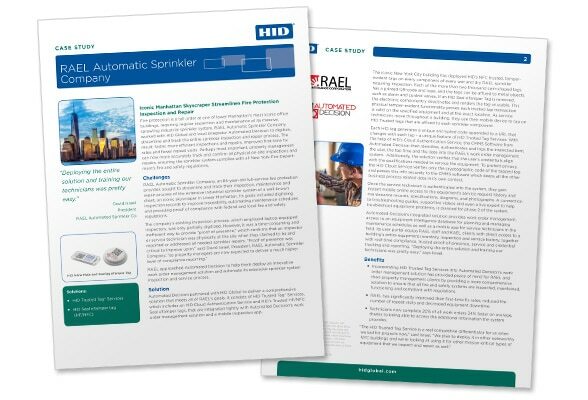 A case study which provides full details of how and why Rael chose to use NFC technology, how the system works and the benefits that it delivers is now available to download free of charge from the NFC World Knowledge Centre.